Are widely accepted by those affected. That the public has therefore no reason for worry. Beck suggests that those of us who accept these assertions without question are in denial, and of course there are commercial interests ready to profit from the sense of denial endemic in our risk society. Beck presents a strong alternative to this disregard for risk. I believe we should carefully consider what he and others in accord with his view have to say. To begin with, the risks to which he refers typically are posed by contaminants that cannot be seen, tasted or smelled. This kind of risk is a relatively new phenomenon; its nuclear form dates only from the 1940s. In the case of Rocky Flats, the principal contaminant is plutonium in the form of minute radioactive particles released into the environment from routine operations and accidents at the now defunct nuclear bomb factory during its production years from 1952 through 1989. The distinctive feature of our modern “risk society” is that the risk is ecological. It damages and destroys the natural ecosystem to which humans and all other creatures belong and on which we depend for our very existence. The resultant damage doesn’t necessarily happen immediately; more seriously, it happens over the long-term. 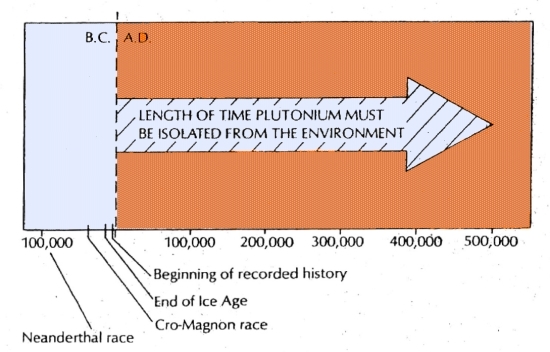 Physicist Fritjof Capra of the University of California in Berkeley shows quite graphically that, because of the toxicity and 24,000-year half-life of plutonium 239 (used in abundance at Rocky Flats), it should be isolated from the environment for half-a-million years. 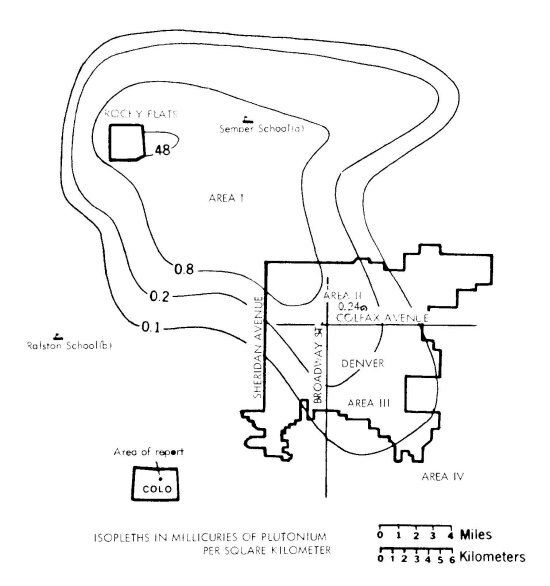 At Rocky Flats, the plutonium was not isolated from the environment but was deposited in it. Further, because a secret deal had been made with Congress to put a ceiling on how much could be spent on the Superfund “cleanup” of the Rocky Flats site, those responsible for the job made no attempt to remove as much plutonium as possible with existing technology. Instead, they knowingly left behind an unknown quantity in the form of minute particles that can be inhaled, ingested or taken into the body through an open wound–the likeliest ways of being exposed to plutonium. Plutonium emits alpha radiation. Unlike other forms of radiation, such as gamma rays and x-rays, alpha particles cannot penetrate skin, but when plutonium particles find their way into the body, the damage they create can be much greater than damage caused by x-rays and gamma rays. Plutonium particles lodged within the body steadily bombard surrounding tissue with radiation, probably for the rest of one’s life. Over time, the result may be cancer, a compromised immune system or some other ailment, including genetic harm that can be transmitted to future generations. “The black star in the middle of this picture shows the tracks made by alpha rays emitted from a particle of plutonium-239 in the lung tissue of an ape. 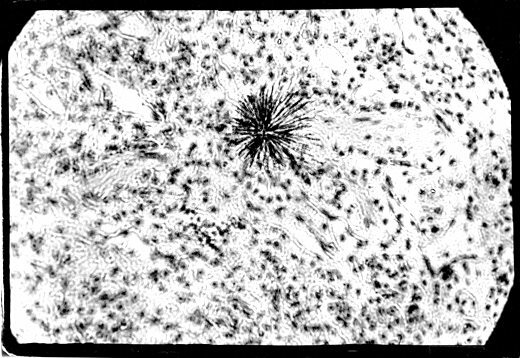 The alpha rays do not travel very far, but once inside the body, they can penetrate more than 10,000 cells within their range. This set of alpha tracks (magnified 500 times) occurred over a 48-hour period” (Robert Del Tredici, At Work in the Fields of the Bomb , plate 39). Herman Muller was awarded a Nobel Prize in 1946 for his discovery that radiation damage could affect future generations. He predicted gradual reduction of humankind’s survival ability due to exposure to radiation over multiple generations (“Radiation and Heredity,” American Journal of Public Health, 1964). His work suggests that radiation introduced into the world by humans may in time destroy our species. A British research team concluded that chromosomal damage from plutonium exposure is essentially “infinite,” because the extent of harm to the human gene pool is incalculable (M. A. Khadim et al., Nature, Feb. 1992). Commenting on the work of Khadim’s group, science writer Rob Edwards observed that the resultant “genomic instability” may account for illnesses other than cancer, illnesses so elusive that epidemiology is “powerless” to detect any relationship between their incidence and exposure to radiation (New Scientist, vol. 11, Oct. 1997, pp. 37-40). What is clear is that the official incautious attitude toward the plutonium remaining in the environment at Rocky Flats after completion of what DOE called its “risk-based cleanup” means we are gambling with people’s lives now and into the deep future. The government agencies that approved hazardous conditions at Rocky Flats and removed most of the site from the national Superfund list are prime exemplars of the risk society. When they tell us that the contaminants left in the environment are “safe,” what they mean is that they meet official standards for permissible exposure. They rarely emphasize that exposure standards by their very nature allow some level of risk. Besides, their ways of calculating risk do not take into account the enormous range of individual susceptibility to exposure to radiation. What doesn’t harm one may very well harm another. Of course, those who establish and enforce standards for permissible exposure know as well as I do that the National Academy of Sciences, in its 2006 study Biological Effects of Ionizing Radiation concluded categorically that any exposure to radiation is potentially harmful. This means there is no such thing as a safe dose of radiation, something that Karl Z. Morgan, “the father of health physics” at Oak Ridge, Tennessee, concluded during his studies that began with the Manhattan Project. And those who set and enforce standards for Rocky Flats must certainly be familiar with the British “Committee Examining Radiation Risks of Internal Emitters” that concluded in 2004 that the cancer risk from very low-doses of plutonium may be ten or more times more dangerous than allowed for by existing exposure standards (see www.cerrie.org ). This last point is strongly reinforced from a different angle by research done by Tom K. Hei and colleagues of the Center for Radiological Research at Columbia University. They demonstrated that a single plutonium alpha particle induces mutations in mammalian cells. Cells receiving very low doses were more likely to be damaged than destroyed. Replication of these damaged cells constitutes genetic harm, and more such harm per unit dose occurs at very low doses than would occur with higher dose exposures. “These data,” they concluded, “provide direct evidence that a single alpha particle traversing a nucleus will have a high probability of resulting in a mutation and highlight the need for radiation protection at low doses” (Proceedings of the National Academy of Sciences, vol. 94, Apr. 1997). In a follow-up study, they found that “a single alpha particle can induce mutations and chromosome aberrations in [adjacent] cells that received no direct radiation exposure to their DNA,” what is often referred to as “the bystander effect” (Ibid, vol. 98, 4 Dec. 2001). During more than a decade that I served on oversight and advisory bodies focused on the “cleanup” at Rocky Flats, when I asked government personnel responsible for protecting public health about such studies, I typically got a blank stare, as if I’d trespassed into sacred space. For several years I was privileged to be a member of two committees of the National Council on Radiation Protection and Measurements (NCRP), a non-government body that researches radiation health effects and makes recommendations to government and industry regarding exposure standards. I hoped, as a token outsider, that I could persuade this elite body of radiation health specialists to open their deliberations to people directly affected by the exposure standards they were calculating, especially to workers in the nuclear industry and people who live or work near nuclear installations. Two activist colleagues and I were invited to make a presentation at the NCRP annual meeting in 2003; there was a vigorous dismissal of what we proposed. Our paper was later published, under the title “Stakeholder Perspectives on Radiation Protection” (Lisa Ledwidge, LeRoy Moore and Lisa Crawford in Health Physics, Sept. 2004). The article garnered zero feedback. I soon thereafter resigned from the committees to which I had belonged. Regarding those responsible for radiation exposure standards, Beck observes: “Whoever limits pollution has also concurred in it.” Official exposure standards “may indeed prevent the very worst from happening, but they are at the same time ‘blank checks’ to poison nature and mankind a bit” (Risk Society, p. 64). In other words, we give the agencies charged with protecting public health permission to poison us. Because susceptibility to toxins varies widely, who can say which one of us will be among the vulnerable that receive a lethal dose? Of course, our friends in the animal kingdom that visit Rocky Flats or reside there are also susceptible. In 2002, a U.S. Fish & Wildlife Service study found low levels of plutonium and other radionuclides in the bodies of deer from the site. This research was done not out of concern for the animals but for humans who might hunt and eat such deer; the study concluded that they’d not be likely to get cancer. Little is known about the effect on wildlife of radiation exposure. Few studies have been done. 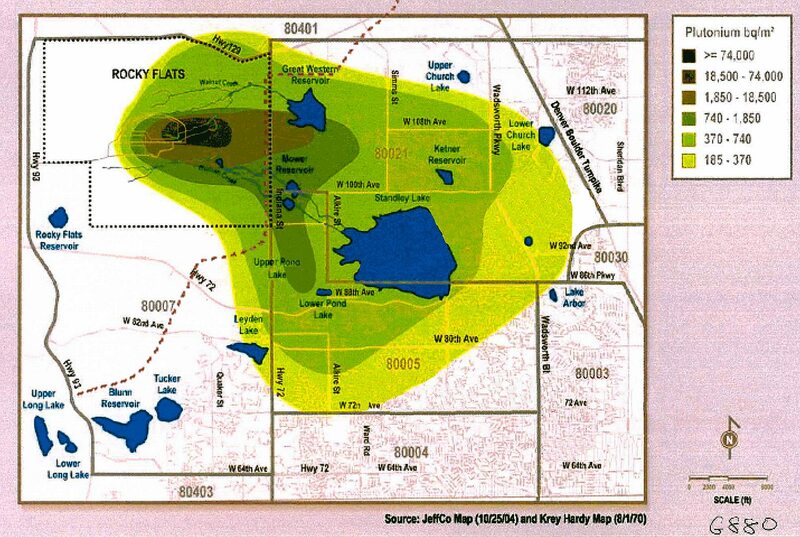 At Rocky Flats none have sought to determine genetic effects of exposure to radiation on wildlife. When Muller discovered genetic harm from radiation exposure he was examining a tiny insect, the tietze fly. Genetic specialist Dietard Tautz says that effects of radiation exposure on a given species of wildlife may not be readily apparent in individuals of that species until the passage of several generations. He calls this a “genetic uncertainty problem” (Trends in Genetics, vol. 16 [Nov. 2000], pp. 475-477). This finding suggests that wildlife at Rocky Flats could in the long term be hurt by conditions at the site, and that by the time humans realize what has happened, irreparable harm will have been done. Elk and deer are present at Rocky Flats in sizable numbers. No studies have been done to determine genetic effects of radiation exposure on these and other species of wildlife at Rocky Flats. 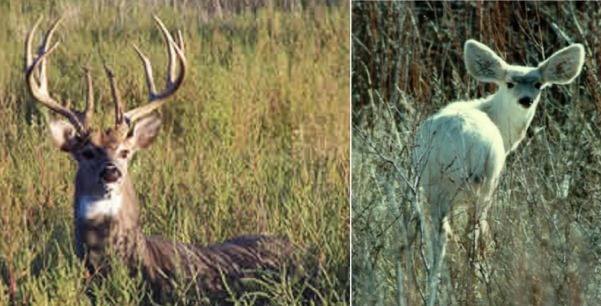 The photo of the albino fawn was taken on the site. A human child is more likely than an adult to stir up dust, to eat dirt, to breathe in gasps, or to scrape a knee or elbow—all ways of taking tiny particles of plutonium into the body. Plutonium within a child’s body integrates with the child’s growth and tissue development. By contrast to adult humans or other beings, a child’s normal life span provides far more time for internalized alpha emitters to harm her or his health. In the face of an environment at Rocky Flats contaminated with plutonium particles too small to see but not too small to do harm, the vulnerability of children was a major reason 81% of the 1,280 parties commenting in 2004 told U.S. Fish & Wildlife Service not to allow public access to the Rocky Flats National Wildlife Refuge. Only 11% of commenting parties explicitly favored access. U.S. Fish & Wildlife (sometimes called “Fission Wildlife”) ignored this expression of public opinion and approved access (see U.S. Fish & Wildlife Service, Rocky Flats National Wildlife Refuge: Appendix H, Comments and Responses on the Draft Environmental Impact Statement for the Rocky Flats National Wildlife Refuge, Sept. 2004; for analysis, see http://www.rockyflatsnuclearguardianship.org/required-reading/public-rejects-refuge-access/ ). Beck points out that the afflictions posed by high-tech and ecological risks “have a new quality,” in that “they are no longer tied to their place of origin, the industrial plant. By their nature they endanger all forms of life on this planet.” This is especially true of nuclear pollutants, because “they outlast generations” and transcend space as well as time in that the harmful material has been and will continue to be carried by the wind great distances. Borders are no barriers to the free movement of invisible radioactive particles. “In the risk society, the unknown and unintended consequences come to be a dominant force in history and society” (Risk Society, p. 22). The foregoing doesn’t square with the “cleanup” done at Rocky Flats, based as it was on the assumption that plutonium left behind will not migrate. This conclusion, reached by the multi-year Actinide Migration Evaluation done at the site, was derived mainly from computer modeling, not from empirical observation. But there are numerous empirical observations to counter this conclusion. The two most notable are, first, Dr. M. Iggy Litaor’s direct detection with instruments set up in the field at Rocky Flats of significant plutonium migration in surface and sub-surface soil in the unusually wet spring of 1995. 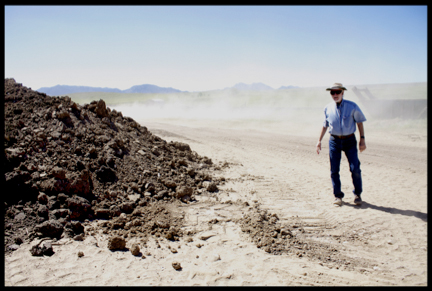 Second is ecologist Shawn Smallwood’s 1996 study of burrowing animals at Rocky Flats. He identified 18 species that dig 10 to 16 feet below the surface and constantly take surface material down and bring buried material up, in the process disturbing in any given year as much as 11 to 12% of surface soil on the site. Their activity makes plutonium particles available for redistribution by wind, rain, traffic, animal, human and other forces (for references and more detail, see “Science compromised,” at http://www.rockyflatsnuclearguardianship.org/leroy-moores-blog/papers-by-leroy-moore-phd-2/ ). One deep digger at Rocky Flats is the pocket gopher. Another is the harvester ant. An unfortunate characteristic of risk society is that most scientists, especially in the nuclear field, have allied themselves with the centers of power in industry and government. The late Karl Z. Morgan, the “father of health physics” referred to earlier, pointed to this situation. He pioneered the field of radiation protection as part of the Manhattan Project and was for nearly thirty years head of health physics at the Oak Ridge National Lab. He was a founder of both the International Commission on Radiation Protection and the U.S. National Council on Radiation Protection and Measurements, the two leading bodies responsible for recommending standards for permissible exposures to ionizing radiation. And he founded the Health Physics Society to protect people. Originally, he and others in this new field believed that there was a threshold of radiation exposure below which harm would not occur, but he came to realize that there is no such thing as a safe dose and, crucially, that exposures at very low doses are more harmful per unit dose than exposures at higher doses. Toward the end of his long career he proposed reducing the maximum allowable lifetime plutonium body burden for nuclear workers 200-fold (American Industrial Hygiene Association Journal, August 1975). His proposal was ignored. After his retirement from the Oak Ridge Lab, members of the Health Physics Society treated him as persona non grata. His autobiography explains how this organization came to be dominated by those more interested in protecting the industry rather than the exposed. He cites the moment when a president of the Health Physics Society told his colleagues, “Let’s all put our mouth where our money is” (Morgan and Ken M. Peterson, The Angry Genie: One Man’s Walk through the Nuclear Age, 1998, pp. 115-116). Colorado was fortunate to have an outstanding public health servant in the person of Carl J. Johnson, MD, for several years Director of the Jefferson County Health Department. His best-known study, published in 1981 in Ambio, the journal of the Swedish Royal Academy of Sciences, showed a direct correspondence between areas of plutonium contamination across the Denver metro area and cancer incidence within those same areas (see the map below). Though both the DOE and the State Health Department tried unsuccessfully to discredit this report, it remains as a work of integrity. By the time the study was actually published, however, real estate interests had gained the upper hand within the Jefferson County Commissioners and forced Johnson out of his job. (For a detailed analysis of Johnson’s work, see “Democracy and Public Health at Rocky Flats,” at http://www.rockyflatsnuclearguardianship.org/leroy-moores-blog/papers-by-leroy-moore-phd-2/ ). The author at Indiana St. and 96th Ave. (SE corner of the Rocky Flats National Wildlife Refuge) on a windy day, June 17, 2011. The proposed Jefferson Parkway would pass directly through the spot where he stands. Nearby is earth moved for the Candelas residential and commercial development slated to run across the southern edge of the Rocky Flats site. Photo by Robert Del Tredici. The U.S. lags behind several countries and the European Union that have written this principle into their code of laws. Laws of course reflect consciousness, but laws also shape consciousness. 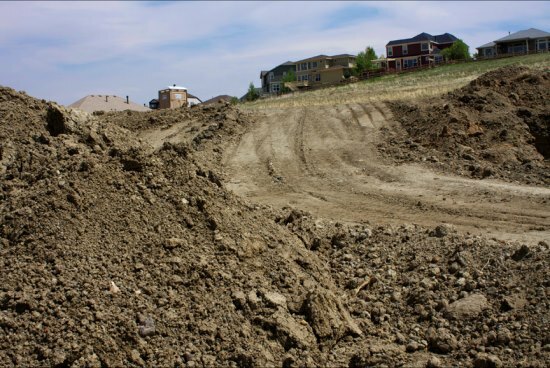 Whisper Creek residential development under construction near the southeast corner of the Rocky Flats site. Photo by Robert Del Tredici, May 2011. Beck points to the necessity for fundamental cultural change, what eco-philosopher Joanna Macy and others refer to as “the great turning” from environmental risk-taking to ecological responsibility. Such a change happens as affected people—and we are all affected—awaken to the dangers of our risk society and join with others to do something about it. The Rocky Flats Nuclear Guardianship project of the Rocky Mountain Peace and Justice Center is devoted to this end. The first principle of the Nuclear Guardianship Ethic is: “Each generation shall endeavor to preserve the foundations of life and well-being for those who come after. To produce and abandon substances that damage following generations is morally unacceptable.” We invite others to join us in the work of Guardianship (see http://www.rockyflatsnuclearguardianship.org ).